Do you still ask yourselves about what is the biggest lesson in your life? Don’t sweat so much. I dare to confidently tell you to stop and halt a moment. No need to think of having a past life regression session. No need to consult to a shaman anymore. Just see around. That is the biggest lesson in your current life. Your father, your mother, your sister, your brother, your children, your wife, your husband…. They become yours for a reason. Think of how well you are as you – a child, a sister, a brother, a mother, a father, etc…. If you still find a gap, then bridge the gap and you are doing your biggest homework of life – family. Never forget your family, the real closest ones in life. Never ignore them, or else you’ll fail the test of life and MUST retake in the next session. You don’t want to retake the same exam, do you? It is your family the biggest lesson of yours. Apakah kamu masih bertanya-tanya apa sebenernya pelejaran terbesar dalam hidupmu? Jangan terlalu dipikirin. Saya berani memintamu untuk berhenti sejenak. Usah berpikir bikin janji untuk past life regression. Tak perlu konsultasi sama dukun lagi. Lihat saja sekitar Anda. Itulah pelajaran terbesar dalam hidupmu. Ayahmu, ibumu, saudaramu, anak-anakmu, isitrimu, suamimu…. Mereka menjadi bagian hidupmu bukan tanpa alasan. Pikirkan sebaik apa Anda menjadi Anda sekarang – sebagai anak, saudara, ibu, bapak, dll…. Jika kamu masih merasa kurang baik, segeralah perbaiki diri dan saat itulah kamu mengerjakan PR kamu dalam hidup – keluarga. Jangan lupakan keluargamu, orang-orang yang sesungguhnya dekat denganmu dalam hidupmu. Jangan abaikan mereka, atau kamu gagal dalam ujian kehidupan dan HARUS mengulang di sesi selanjutnya. Kamu nggak pengen mengulang ujian yang sama kan? I took pictures of some orangutans in Semenggoh Wild Center, Kuching, Malaysia – adult and young and got causght by this particular pose. 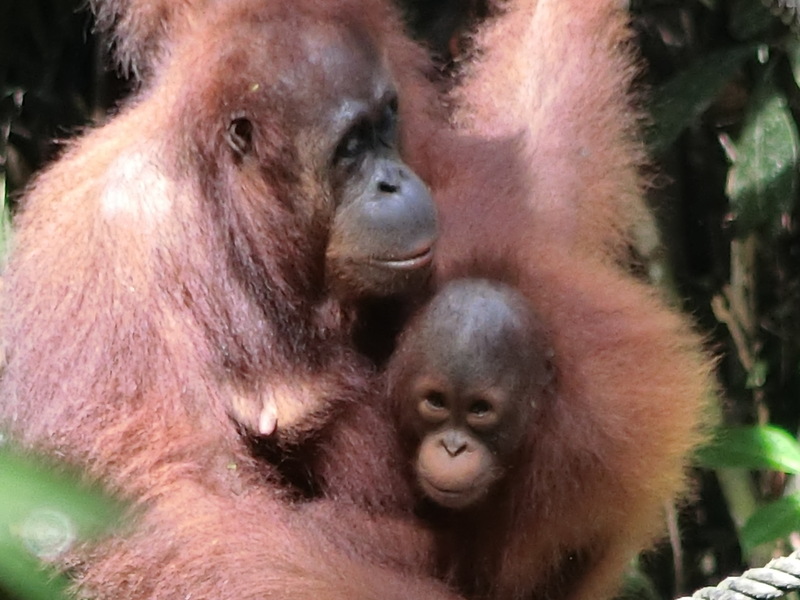 Not really a pose made but let’s call it a pose — one orangutan mother was having lunch with her toddler. So playful and fun – yet nobody of the spectators expressed their excitement with sounds. 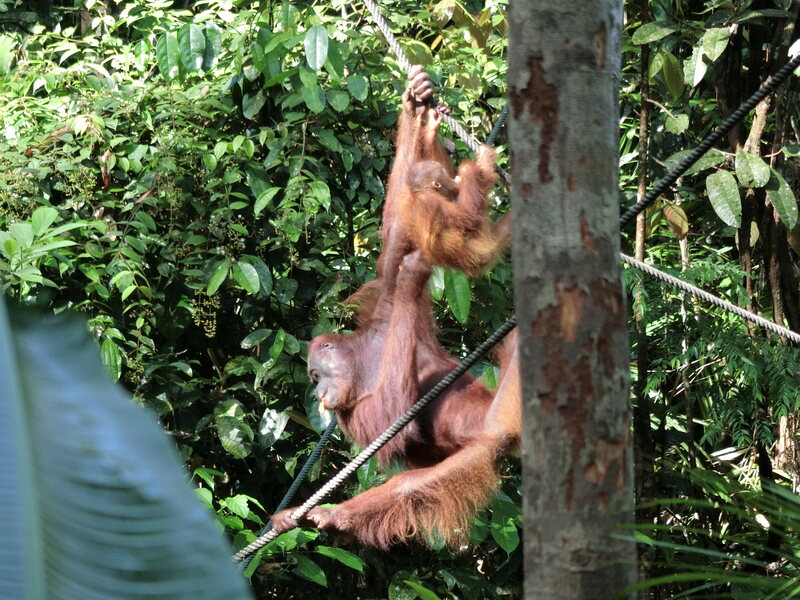 All were smiling and some children were making very soft giggles (normal to loud voice would alert orangutans to go away). Just enough to know that we all felt the joy of witnessing the loving bond between mom and kid some 50 meters away of us. Lesson I learnt: how ugly and silly your mom is, she is still the most understanding human on earth so never give her up. And, how ugly and silly your child is, s/he is still the most adorable one so don’t let him/her down.